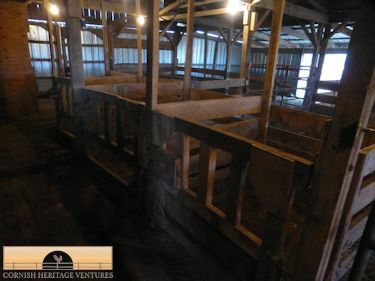 I did something this past week that I had never done before: I dusted the barn! No, I didn’t take my feather duster down there but I did take my broom. Why on earth would you dust a barn, you ask? 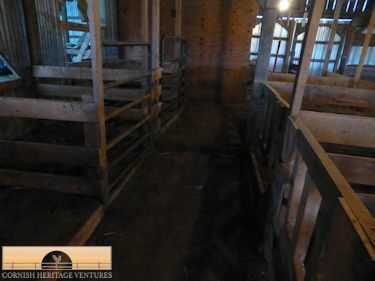 An unused barn, without chickens flapping around, tends to get dusty and this past week was the week we determined to work on not just cleaning but fixing. Each afternoon, after school and lunch, we could be found down in the barn. 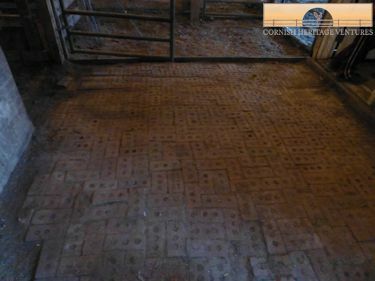 This brick walkway had not seen the light of day in six years! The only reason we knew that there was brick under 2-3″ of dirt was that we saw it when we first viewed the property. Once we moved in and the animals took over it gradually got covered. This was the first job Daniel and I did. Richard’s first job was to work on the electrics. Way back there had been a short out there causing it to trip. Richard had disconnected the wire, bought replacement but had never gotten around to fixing it. Having no lights and power in the barn had been a pain but one we had lived with. I am pleased to announce that new wire is now installed and the lights and power are back on as is the power to the chicken house out in the pasture. The next job was to work on the walkway between the pens. At one point, when we had a sow that we thought was going to farrow but no space for her elsewhere in the barn at that time we had put her in the walkway. BIG mistake! The following morning we came out to find that she had dug up the walkway and we could no longer open some of the gates to the lower small pens. Of course we were busy, didn’t use most of the pens anyways as they were too small for the pigs and, they preferred to be where they had access to the outside so this was another job that never got done. Add to that 300 chickens roosting all over the barn and the “soil” just grew! Daniel went to work on the walkway this week and boy, what a great job he did! I’m not sure how many cart loads he took out of there but it was a lot. (10-20 would not be an exaggeration!) Then it was time for Richard and I to rehang the metal gates and mend/rehang the wooden ones. I have to admit I didn’t help much with the wooden ones as I was giving the house a good clean and doing 7 loads of laundry (bedding etc.). I did dust out there though 🙂 We now have six, small, working pens! Whoo Hoo! There are cows in the main section of the barn and out in the pastures. They had kindly pushed out one side of the barn so Richard and Daniel had to fix that also and prevent them from doing so again. With all that accomplished, it was time to clean out the tack room i.e. junk room! Richard, Daniel, Hannah and Caleb had great fun doing that. It really was disgusting. There are now some long lost tools that need to be cleaned up, a big pile of junk that we need to dispose of PLUS goodies neatly stacked that we will be leaving for the new owner when they come along. By the end of yesterday we were all tired out but it felt good to have accomplished so much. 🙂 Yes, the weather was in the 50’s and 60’s which is great for January!